Sometimes ‘having your cake and eating it too’ can take on rather unusual dimension and result in physical injury – like getting thrown on to a rock-wall jetty by large waves and strong currents in cold winter conditions. So remember to be careful what you ask for and if your ‘eyes are bigger than your stomach’ be ready with bandages and aspirin, but also be ready and go back for more… as the lessons here can be rich indeed. After breakfast together, taking this picture and negotiating a hot shower location in the next door campground, I get in the water while Dominique goes to find a better place to stay at the motel’s sister location. The currents at the Groins are complex and dynamic. This is the threshold to Gray’s Harbor and the water really tears through here. You’ll note that the ship in the picture swings the other way when the tides coming in, so definitely something to contend with. I’d watched folks and knew which way was the best way out, but took my own path, to ‘save time’. 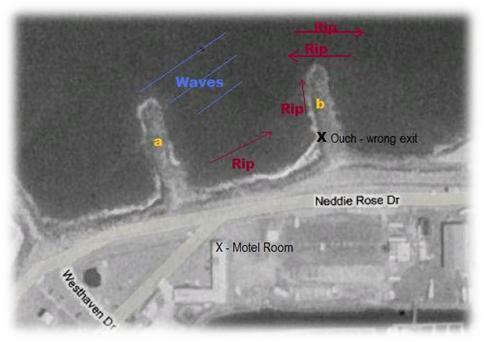 The Incident – I jumped in the water to the right of jetty ‘a’ and the rip dragged me towards jetty ‘b’ as I fruitlessly attempted to get out. It seemed useless, so I decided to abandon, turned in and tried to climb out at jetty ‘b’. This didn’t go well and I was thrown on the rocks by a large wave, smashing my new board and both my legs quite badly. Once out and on the jetty wall, I sat for a bit, I inspected my board and legs and then crawled into the water to the right of jetty ‘b’ got out and tried to catch a few waves. I was hurt so I didn’t stay long. Again – the next morning I came back and this time went into the water to the right of jetty ‘b’ and got out past the break right away. The problem was that I was ‘way out’ past the break and to the right of jetty ‘b’ but the waves were breaking off jetty ‘a’. The current was against me out here and I was moving backwards as I paddled. I was frustrated. 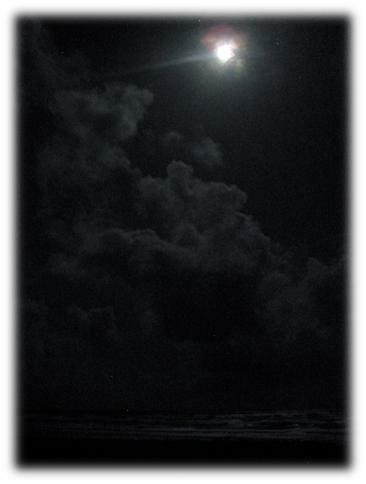 Finally, I stopped going against and actually started paddling back in towards the jetty and across the current. I moved towards the rocks and then sat still in the water for a bit to recover my strength. To my surprise I noticed that I was moving in the current again, though this time in the right direction; opposing currents. I had had to stop and go towards the rocks; in other words, changing my altitude, as well as stopping to notice what was happening before I could actually find my way. At this point I moved quickly out to the break and started catching waves. And Again – as luck would have it I got caught inside after a nice ride and found myself between the jetties with several large sets of waves coming back to back. I couldn’t believe it! I was determined not to get thrown on the rocks again, yet I didn’t see how I could avoid it. 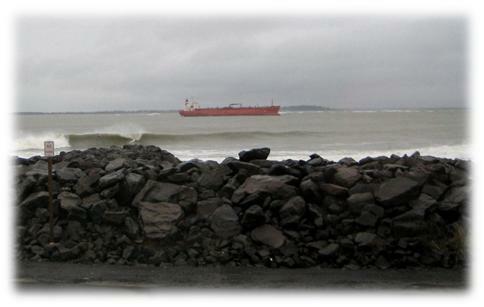 The waves were 2 meters plus and the current strong enough to turn a ship. I felt I’d been had. The Decision – at this moment I had to turn and make an exit or keep trying. I chose to keep trying and stay my course regardless. Accepting the rock wall and my situation without changing my intention or abandoning my effort was a breakthrough and fortunately ended up being the best choice. What happened was unique. When I got within 1 meter of the rocks, I found myself caught in a strong outbound current and before I realized it I found myself 20 meters out past the jetty and wondering what had happened. If I had turned in, my previous day’s experience would surely have been the outcome. I changed course, paddled back in a bit to catch the current I’d learned about earlier and headed out to the line-up just as the sun was just cleared the clouds on the horizon. I enjoyed some great waves for the rest of morning. Reflections – sometimes you have to eat it (your cake) again and again until you actually get it! 1. If you know what’s right, do it. Going against or taking shortcuts can be harmful. 2. If you don’t understand a situation and are getting nowhere try changing your altitude and being still. This may help you to see what’s actually going on. 3. Accepting what is without abandoning one’s intention can lead to tremendous breakthroughs. 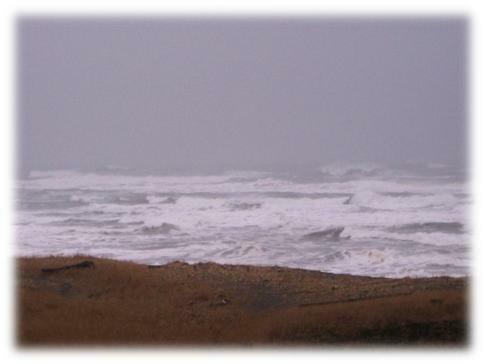 The Retreat – the second lodging we had was a wonderful condo out by the open ocean. The waves here were impenetrable, though awe-inspiring by day and by night and a perfect setting for our year-end retreat.